I built this coffee/toy-storage table from scratch, yay me! Words cannot express the sense of accomplishment and excitement I am feeling right now! 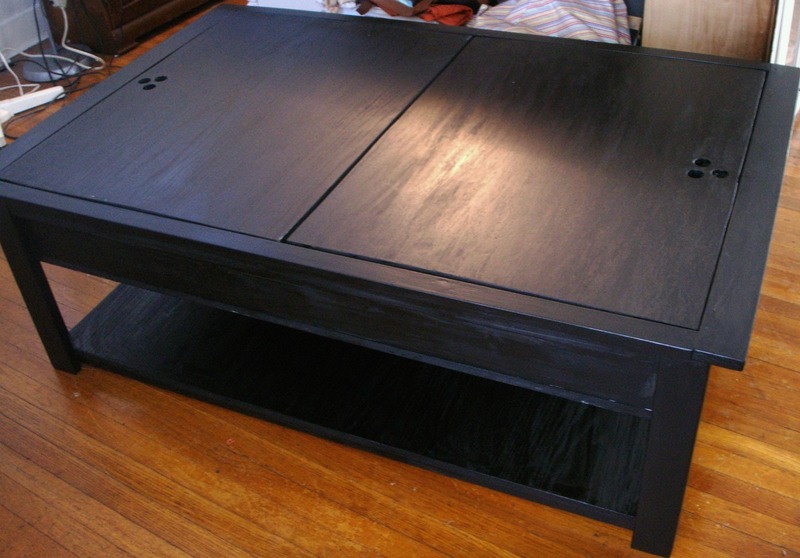 Yes, I actually built this gorgeous coffee table (which secretly stores toys!) from scratch. I actually drove my minivan to Menards, had all my wood cut (this helped A LOT!) came home, built and stained this table. From scratch. Wow. How did this happen? Well, it all started when I discovered the genius that is Ana White. This woman is nothing short of amazing. Seeing how expensive beautiful sturdy furniture is, she decided to take a shot at designing and building furniture inspired by the likes of Pottery Barn, West Elm and Design Within Reach. And you know what, she was beyond wildly successful at it. What’s even more amazing? She puts up her furniture plans, with instructions FOR FREE on her very popular site: Ana-White.com. nice pile of wood, huh? Ever since finding her site about 2 weeks ago, I’ve been itching to build something. I had thought my first build would be the fabulous picture ledges. I got the wood and everything. Then I wanted to build the farmhouse bed ASAP, but realized that would have to wait. Then last saturday I took one look at my disheveled family room with toys strewn about everywhere and realized it had to be the lego/train table. I have had a lifelong love affair with carpentry, but I’ve always lacked the space and tools (or so I thought). I’ve built a few things over the year, but never actual usable heirloom quality furniture. She has simplified the plans to where anyone with the desire can build the pieces. There were no complicated joints, skills or tools required. I built the table using a corner clamp and my cordless drill. I had all my cutting done by the good folks at Menards. The table took me about 5 days from start to finish. Had it been summer, it could’ve been just 2 or 3. I did all the work in my front room (my studio) since I don’t have a garage. I built while the kids were at school, which meant I only had about 4 hours between the time my oldest kids went to school and when I had to pick up the preschooler. My 9yr old daughter was dying to help, so I let her put in a few screws with my help. no fingers were lost during the build. I built my table mostly to her specs, but I made some minor adjustments. I used the dimensions for the train table so my Thomas-obsessed preschooler could build his train set on top of it. I also cut the table top in half so one side could slide back and forth when the other side is open, and they could put their toys on that half. That was part of the original Lego table plan, but I’m not sure it was part of the train table plan. 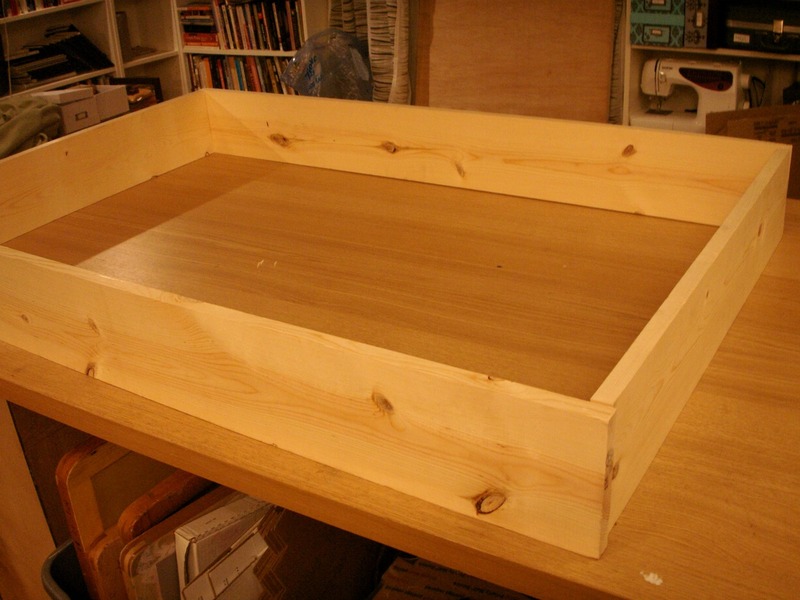 I also cut three finger holes on either half of the top in order to lift out the table easier. Use corner clamps when building a box. You think you will line up the box square, but you won’t. One bad corner and your whole box will be thrown off. Take your time and do it right. The beauty is in the details. I am terribly impatient and want instant gratification. Plus I had my middle son hounding me about how when I’d have it finished. He was dying to have his lego table! I hate sanding, and I hate waiting between coats of stain, but, I know I worked to hard on the piece to ruin it at the end by not having the stain look good. Ventilation is your friend. Since I have no garage, I was building in my studio (inside my house!) This means dust and fumes. I had my front door open with the fan going (did I mention that it was about 20 degrees outside?) Yes, I hated hearing my central heat run continuously during the staining portion of the build, but it’s nothing compared to lung problems in the future. I am amazed at the difference this table has made in my family room. The room looks cozier and more organized, and I was able to fit all their toys in it using plastic bins! So, that’s my first Ana-White furniture build. I urge you to go check her out, and if you’re even just a little bit interested, pick up your drill and build something! Now, onto my picture ledges, my walls look bare…oh, and my bed too, oh my! OH MY GOODNESS! This is hot! You did this?!!! I see you are a Jack of many trades! I love it! The folks on the Knock-off Wood facebook page are raving about your build! What stain was that you used? Thanks for checking it out. I used minwax ebony with polyurethane in a matte finish. I’m so overwhelmed by the response on this. Thanks all! Ana is dying to know who did this! It’s absolutely amazing! Great job! Your awesome. That table is awesome. I agree Thank YOU Ana-White!! IT’S BEAUTIFUL!!!! I really need one of these. Thanks for sharing the info, I’m about to go onto the Ana White site right now. Great Job! It turned out wonderful!! It’s an honor to have you visit 🙂 Keep up the GREAT work! Thanks to everyone who checked it out. It was a wonderful experience I plan on repeating again soon. thanks Libby, it was really fun to work on! that’s incredible! I just finished priming and painting 700 sq feet of our basement after my dad put up new dry wall. Maybe I’ll keep the momentum going and tackle this next! I say go for it, especially if you have the space to work indoors in the winter. Love it! I especially like the Lightsaber storage – we got a few of those we need to corral too! This is just gorgeous!! I am so inspired, first by Ana’s table and now by yours. 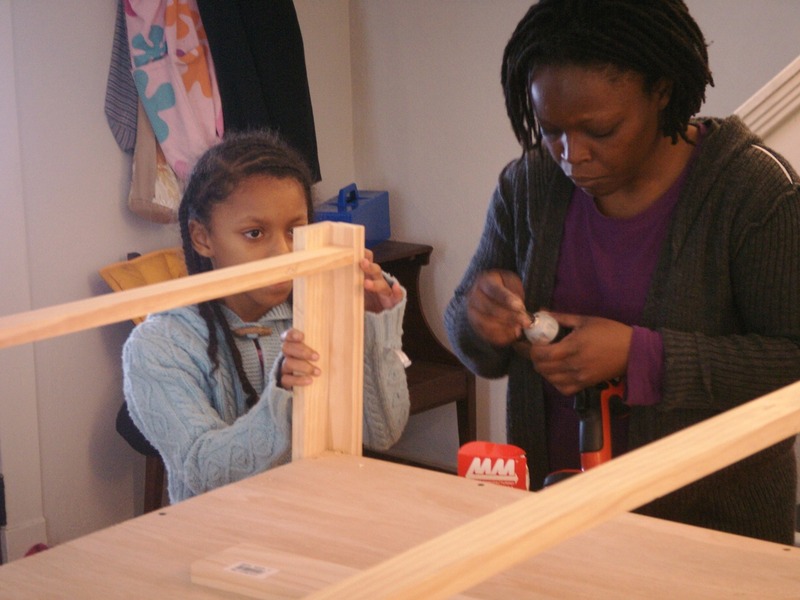 thanks ladies…looking forward to more building, thanks to Ana’s wonderful plans! WOW!WOW!WOW! Glad I found you via Ana White, whom I just discovered this morning. I’ve spent all morning trying decide where to begin. What a great table! Congrats to you! thanks Cornelia. I will put this post on Ana’s page as a guest blog and I will include my mods to her plans. Thanks for the sweet comment on my blog…seriously, 39 isn’t half as bad as 49! I can totally tell the difference in the last 10 years, and it isn’t pretty 🙂 I am so glad you left a comment so I could have the opportunity to come over to your blog, I love the title of your blog. AND!!! No flippin way did you do that? AMazing. I am intimidated to do such a project, you go girl! I love it! Ana’s site rocks, I fell in love with one of the dining tables and can’t wait to start building my own stuff with my husband for our new house. I’ll have to put this on our ‘to do’ list too for my son’s toys! I love this build. Do you have a cost estimate? I have a 20 month old at home and another on the way. We live in a 2 bedroom apartment and are always suffering for storage, plus our coffee table stinks. This is such a fabulous idea, perhaps a good summer project. Thanks for stopping by. The table was roughly $100 including the stain I used. The wood portion came to about $70. It would be a great spring/summer project. I hope you enjoy the process as much as I did! Wow, that is awesome!!! I love it! so organized. Can you send me a link to the instructions for Ana White’s train table? Her white site isn’t working and I didn’t see it on yours.